So many new things happening over here at Little Lovely Leaders! As you may have already noticed, the new blog design is up and ready! Yay!! I am just so in love with it! Becca, from Jumping Jax Designs, did an amazing job! She is seriously incredible! She did everything with the blog, and is also behind the design of my new store site, which will be in working order as of May 5th! So soon! Some of you may already be using the binders I have been selling on TpT for a few years now. I decided that I wanted to create things for myself that were more modern looking..more clean..more tasteful and "adult" looking. I am really excited about the designs I have coming out May 5th. 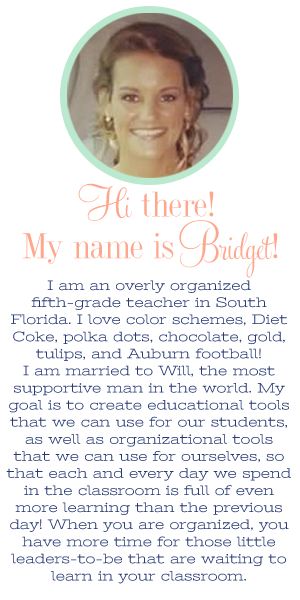 This one, the "Out & About Teacher's Life Binder", is my first design of the few coming out this year. I just love it so much and can't wait for y'all to see more of it! Over 200 pages of helpful forms for you! Some pages included are: a calendar for the 2014-2015 school year, meeting notes pages, teacher forms for students and parents, grade book pages, conference pages, to do lists, and more! There are sections for your school life, your home life, your finances, your substitute, etc. This is an ALL IN ONE binder! Plus, because you will put it in a three ring binder of your choice, you can always put more into your binder! Make it your own! Calendar pages for each month. Between each month are notes pages for you to keep your notes from meetings that took place in that month...or anything else you want to write down! Planning pages for 41 weeks! Keep track of when you send home "happy notes" with your students! I find that this is something I was lacking, and now that I have it, it is my favorite page in the binder! Keep track of important information from parent-teacher conferences, and you will be able to quickly reference them later if you need to look back on a conference. I hope you guys like the new blog design as much as I do! Also..the new Teacher's Life Binder! Keep checking back for updates OR just wait until MAY 5, 2014 (Monday) to preorder your binder! It's never a bad time to get organized!